Internetties, I am thinking of becoming much more serious about writing (Not HERE of course, here you'll still find mindless drivel, pocket lists, recipes, half-baked poems, chicken news and blunk drogging). I have a lot of stuff to say, apparently, and I've had plenty of practice writing over the past TWO AND A HALF YEARS! Wow, I've been writing for two and a half years! You bloggy buddies have given me such awesome encouragement, corrected my spelling, awarded me with cool buttons, offered feedback and been real friends. So I'm beginning a journey today: Nan, the Writer. What do you think? Any advice? There are some cool writing websites out there that I've been checking out. I'm going to the library tomorrow, to grab some books on writing, freelancing and so on. I'm thinking of doing a course. What do I need to know? And, say I was going to write a column on moving to Bournemouth for a local paper. What would I call it?? 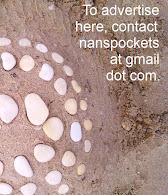 Do you know, I love the name of my website: "Things I've Found In Pockets" was a flash of inspiration, something I didn't even have to think about. But now, I'm stumped. I want something witty and brilliant and totally amazing (like me!). "Fierce Invalids Home From Hot Climates" is taken, alas. So, here's a chance for YOU to win a prize, my friends! Suggest a byline for me. If I decide to go with your suggestion, I will write a guest post for your blog, all about your awesomeness! Or any other topic of your desire. Anything at all. As long as it won't lead to my being arrested. Hee hee! This is so exciting! Stranger in a Strange Land. I think you would be (are) a great writer. Go for it! It's in your genes. You're born to do it. "There are no chickens in Bournemouth"
"From de bush to de beach"
Ooo, I really like "From De Bush to De Beach"! I gots no good suggestions for you, just have fun with it and I am very inspired by you! From Sandy toes to fuzzy socks! i've written and edited freelance for about... 25 years now? time does fly. Doesn't always pay well, but sometimes it does. Then you land a book deal! Well, i haven't. But i think you could. I could too, someday, who knows? You are superb writer -- such a nice touch, and such a good way of blending the serious, the whimsical and the domestic. it's a gift. Yes, a superb writer! Starting today, when someone asks you what you do answer: "I'm a writer". Good for you, Nan! Doing what you love is a great way to make a living. Yay for you! I think "From de bush to de beach" is an awesome byline...but titles have never been my strong suit. At the risk of sounding self-promoting, you need to check out The End of the Book just published by Bridle Path Press. It's a good resource for writers at any stage in their careers. i LOVE reading your writing!! you are a fabulous writer...not a bad way to start a job =)!!! I like for Island hopping! Tales from a small Island? nice double entendre huh! Mum's suggestion: "Out of the frying pan into the freezer" One day she'll actually comment! Sandy toes to fuzzy socks has it for me, Sean yo are very creative to come up with all those, must be cause you married to she, LOL! Anyway, Nan, go for it, you have the talent and most importantly the attitude, mindset to do it.